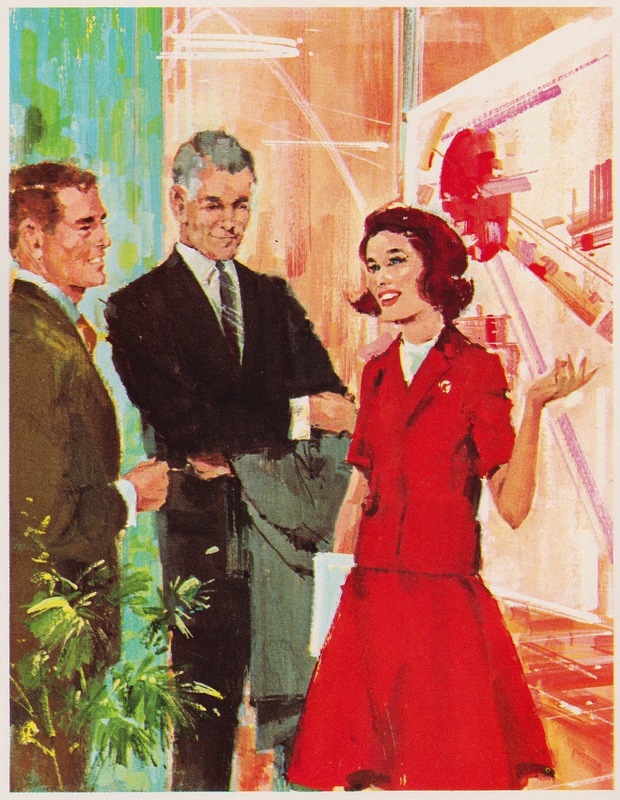 As a matter of the happenstance, the General Electric exhibition was also the one pavilion that reflected the true nature of the New York World’s Fair- part trade show, part international summit, all parts space age optimism wrapped up in the flash and glamour of striking googie architecture and corporate might. 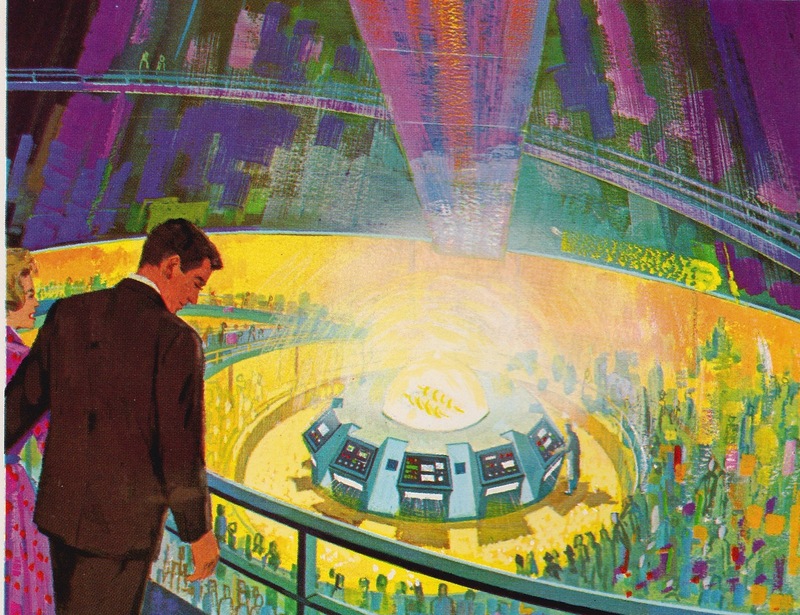 Of course, to any student of theme park history, this will sound familiar, with the earliest iterations of Disneyland’s Tomorrowland and Walt Disney World’s EPCOT Center both reflecting optimistic, corporately branded futurism. 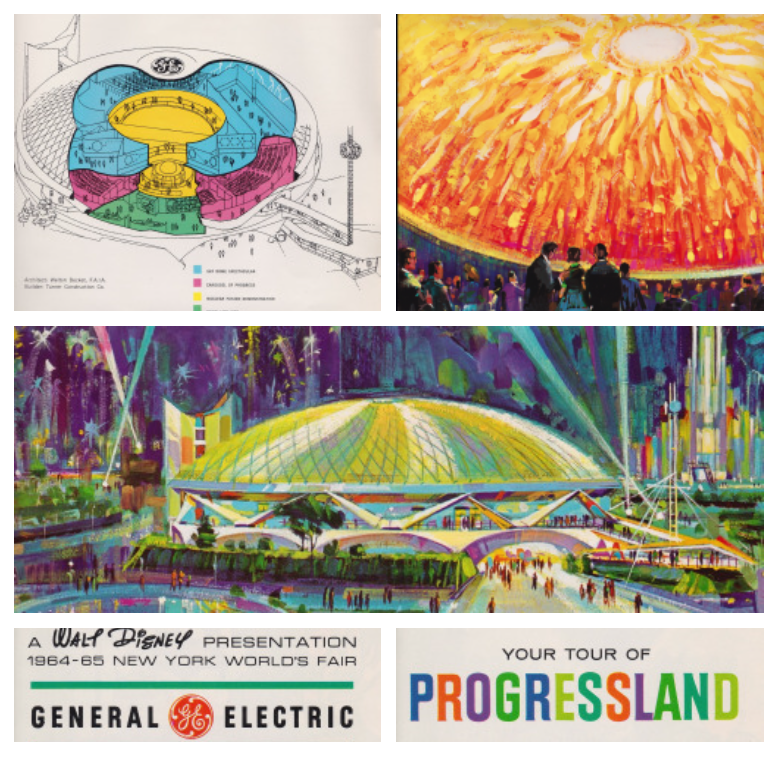 Progressland, being no different, was driven by General Electric’s desire to exhibit their product and industrial roles in a commercial and public light. As most corporate entities at the fair did, they signed on specific design firms to create their thematic exhibits. General Electric chose Walt Disney’s WED Enterprises to lead such an effort and their final product remains, to this day, one of the most beloved and long running theme park attractions left from this point in time. The Carousel of Progress still spins happily along in Disney World’s Tomorrowland, even if the 21st century has caught up with it and its thematic background drastically altered. But, this is only one part of the Progressland Pavilion that originally graced the shores of Flushing Meadows’ Pool of Industry. 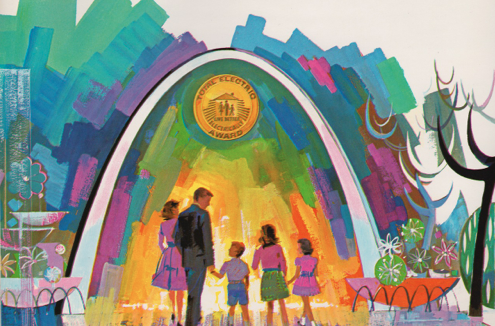 In 1964, Disney had designed a whole series of ancillary attractions for the pavilion, attractions that would have accompanied the carousel’s message of industry and optimism, and would have represented GE’s full breadth of services and appliances. 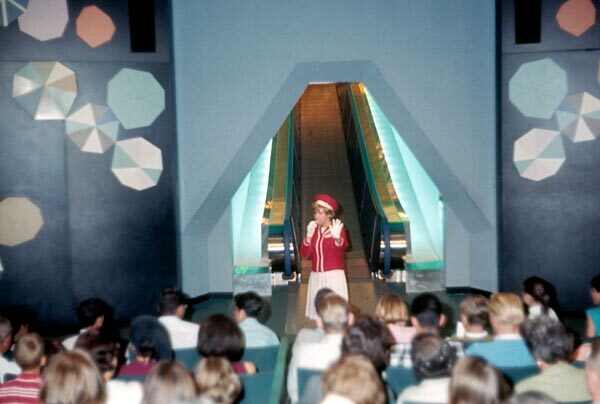 In media, today, these attractions rarely are discussed, and even by fairgoers were relegated to the back seat, when compared to the audio animatronic laden rotating theater show. 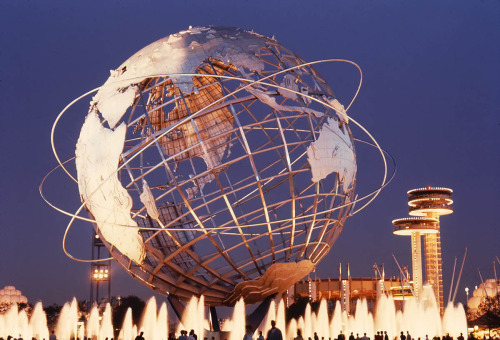 However, they bear interesting insight to the nature of the World’s Fair of 1964 and prove to even be a object of longing for some theme park fans, today. 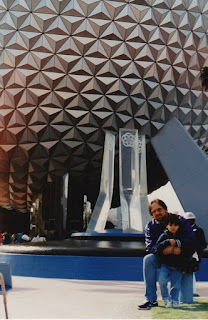 For those of us that enjoy EPCOT Center and the thematic showmanship of specific industries and trades, Progressland and her Medallion City, her SkyDome Spectacular, and her Nuclear Fusion Demonstration will be very redolent of the shows we’ve lost along the wayside in places such as CommuniCore, Spaceship Earth, and the World of Motion. The concept is very much the same- a multilateral company hiring Disney to design and showcase their commercial triumphs and endeavors. 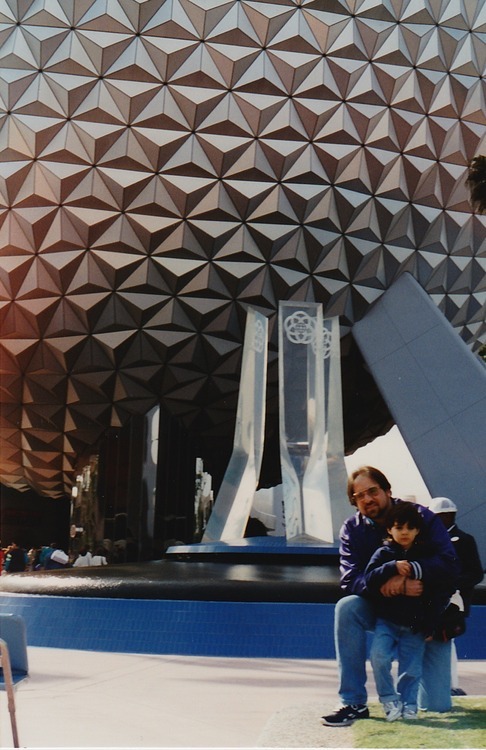 What follows is a rare and in depth look at the Progressland pavilion and its intents, aesthetics, and exhibits. 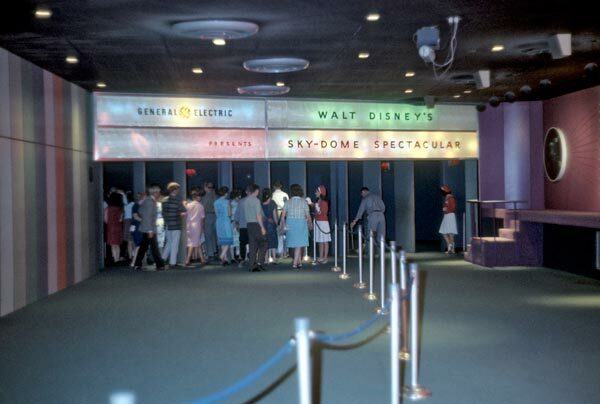 While I won’t go into the details of the 1964 iteration of the Carousel of Progress, as that’s been assessed and documented with descriptive powers far better than my own, I would like to point out the aesthetics and details that the rotating theater cars had. 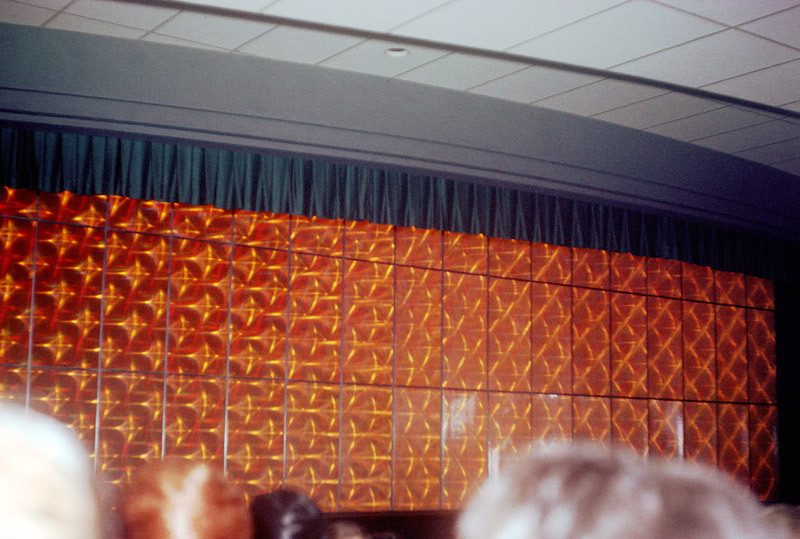 What you see here is a Kaleidoscope Screen, reflective glass and plastic that lined the walls of the pavilion’s theaters. During the introduction to the Carousel of Progress, these lights would flash and glow in sequence to the narrator’s voice and the iconic music of the pavilion. The carousel theater show, from then on out, progressed in a manner very much akin to the experience you can still find in the Vacation Kingdom, today. 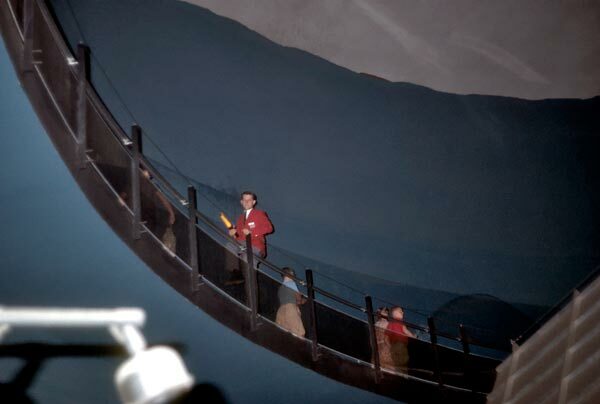 When the show ended, though, guests were lead up to the second level of a pavilion by a speed ramp that was connected directly to the theater, and in place of the stage. 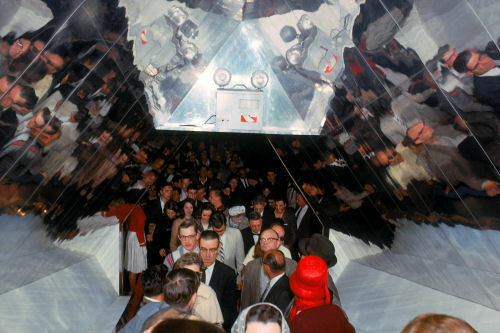 This unique feature of the 1964 carousel only existed in the first two versions of the show, and streamlined the entire experience. Also, the visceral experience of “walking forward” and “springing up out of your seats to meet the future” help crystalize the optimistic sand hopeful message and imagery of the presentation. The speed ramp was quite the sight, too. 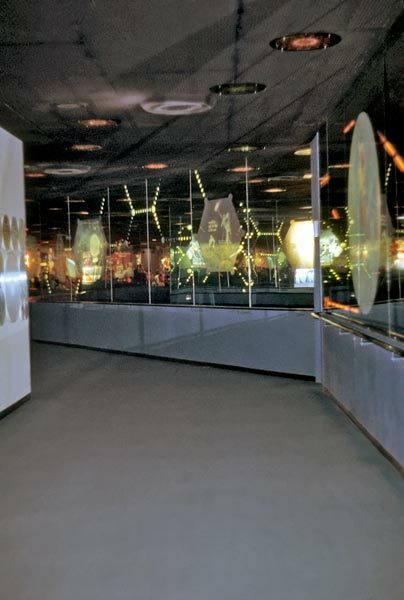 Clad in mirrors and brushed metallic trappings, the entire corridor was a spectacle of light and luminosity. 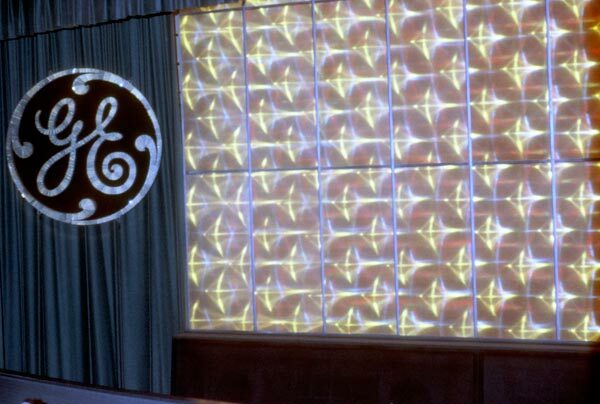 Images of GE engineers and scientists were projected onto the walls and mirrors and had the effect of floating in space. 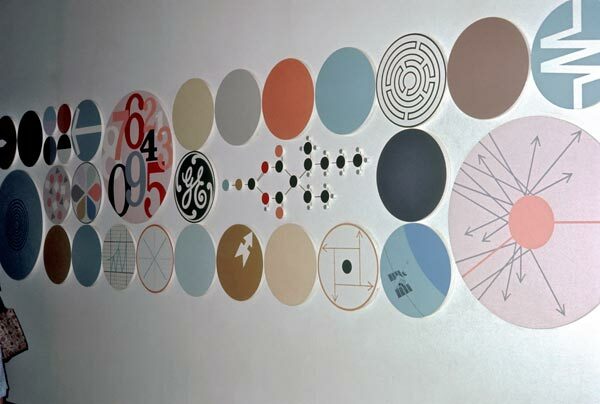 Much of the focus of this imagery is on energy technology and industry, the theme of next show. Disney dubbed this area a “Time Tunnel”, one that transported you from the present to the far-flung, but foreseeable future. 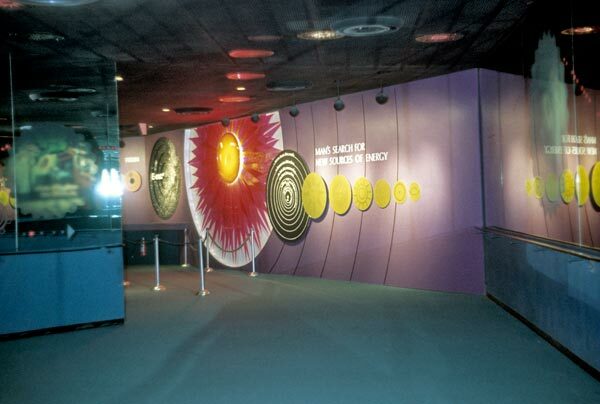 Once guests exited the tunnel, they were deposited in the second part of the Progressland show: The SkyDome Spectacular and Fusion Demonstration, prefaced by another corridor of mirrors and informational plaques detailing GE’s work on electrical energy and new technologies with fuel cells, thermionic conversion, and magnetohydronamics. 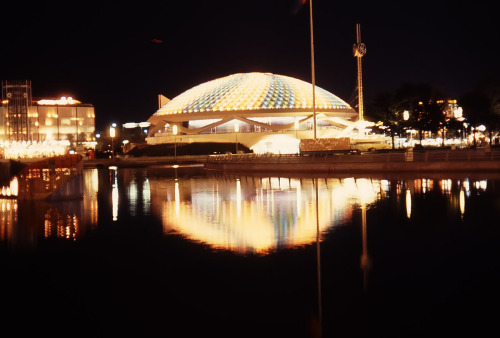 After a short wait, guests entered the SkyDome, and, at the time, the world’s largest projection screen on the interior of General Electric’s iconic domed pavilion. With terraced viewing, guests were shown the history and adventure surrounding man’s struggle to temper nature and making fire serve civilization on a 200-foot screen in the round. Dramatic lighting and projections highlighted both topic and theme. 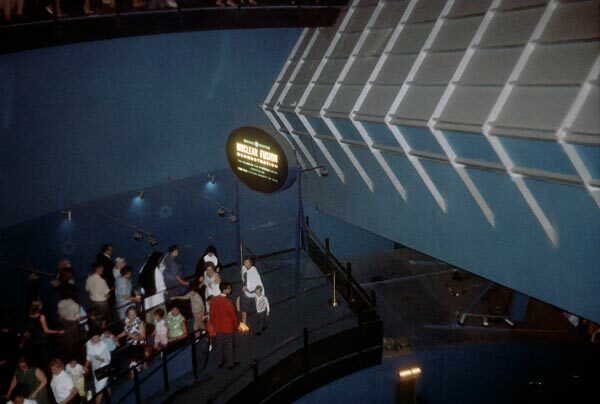 Once the show ended, guests descended from the top level of the pavilion to see the actual technologies described to them in use. 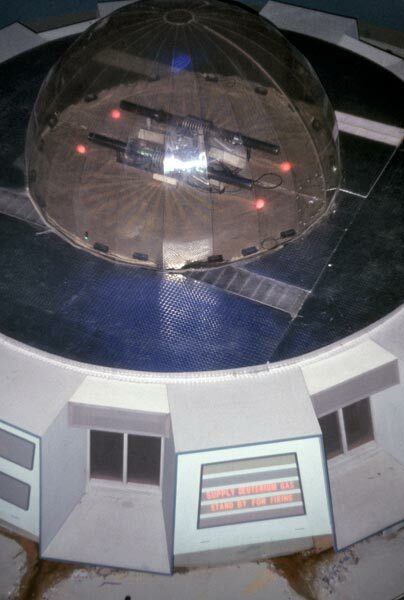 Considered the climax of the Progressland experience, the Fusion Demonstration beneath the domed screen and in another, smaller, theater in the round. Standing on a plinth was a large quartz tube, with control panels and displays detailing the process of fusion that would be attempted. After a countdown, brilliant flashes of light and a loud, popping, crack would signify that GE was successful in tapping into the nuclear science of sun building. 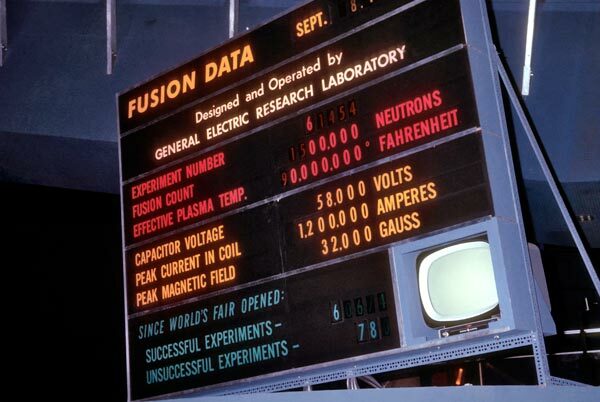 Billed as a first public demonstration of fusion, this feat took place every 4-6 minutes. 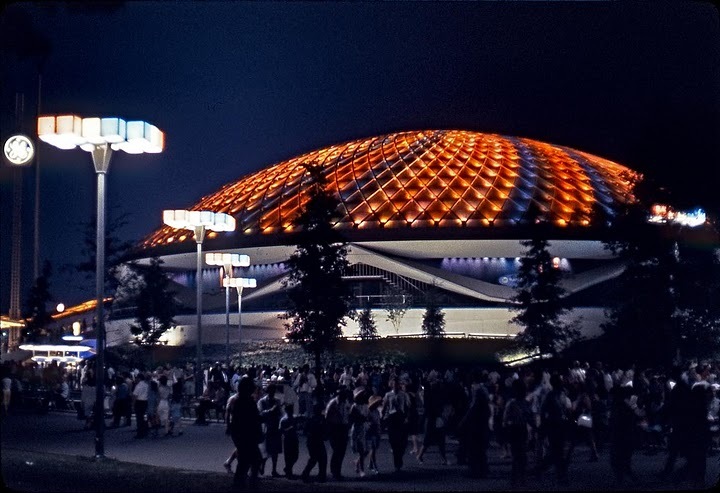 Clerical workers that staffed the pavilion soon grew accustomed to the loud explosions emanating from the dome, according to memoirs and recollections many years after Progressland had closed and moved to Disneyland. Finally, guests would make their way into Medallion City, back on the first level of Progressland. The city was named for the “Total Electric Award” medal that GE popularized for its products. 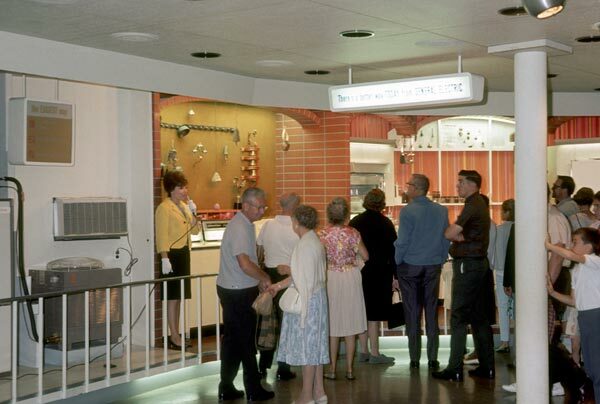 Widely considered to be the post show of the pavilion, this was the main exhibition hall for General Electric and was a stylized city with buildings dedicated to each of the company’s initiatives and appliances. Among the topics showcased were beauty and comfort products, business and industrial solutions, and even a town hall and hospital featuring the latest in electrical ingenuity. 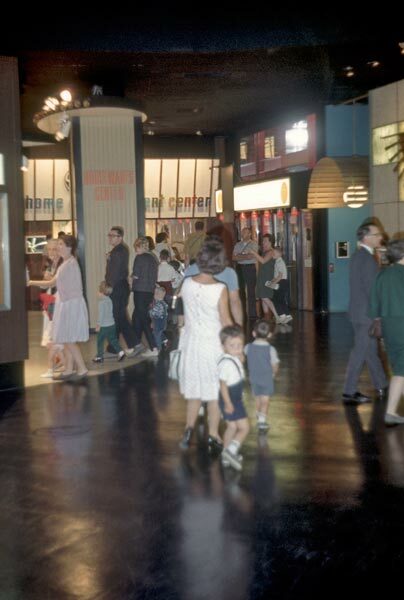 Fully air-conditioned and comfortable, Medallion City was very much the showroom for GE and guests could even place mail orders for the products they had seen in the Carousel Theater, and now, in person, and in use. The idea of allowing guests to browse a “city of the future” certainly wasn’t new to the World’s Fair, either. General Motor’s Futurama at both the 1939 and 1964 New York World’s Fair exhibited an “Avenue of Progress” in which guests would see their automobiles on display. 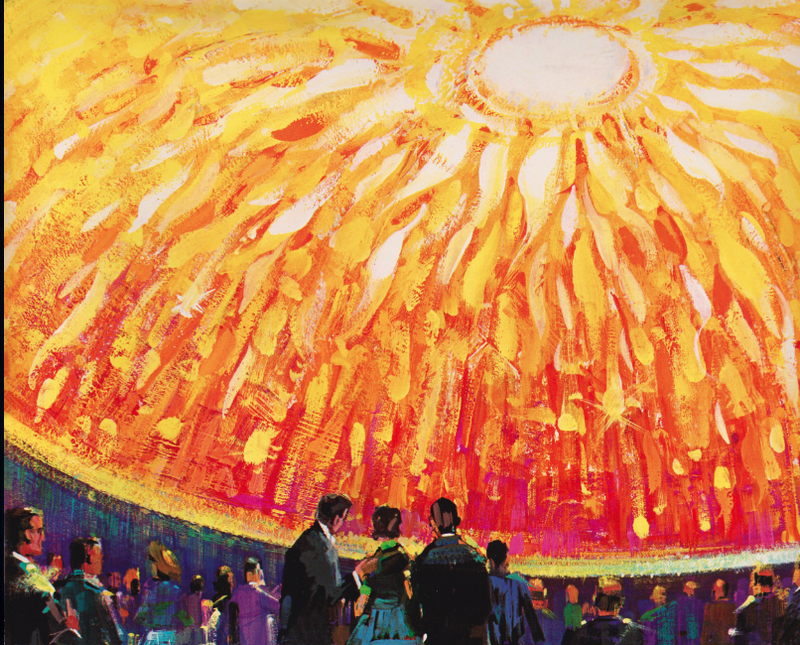 Ford’s Wonder Rotunda, another Disney creation, also showed off automobiles to their guests. 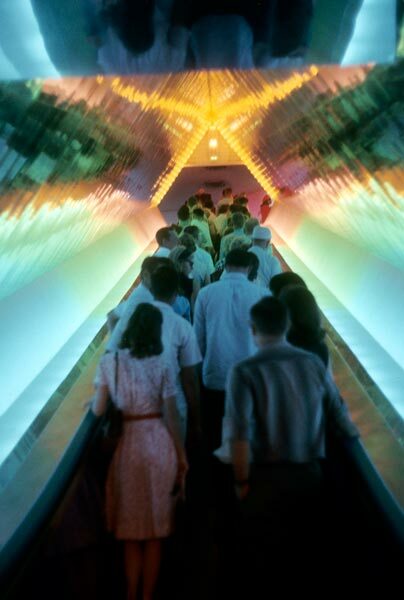 This degree of cooperate was the widely accepted modus operandi of the fair, and this style was replicated, much later, in EPCOT Center. 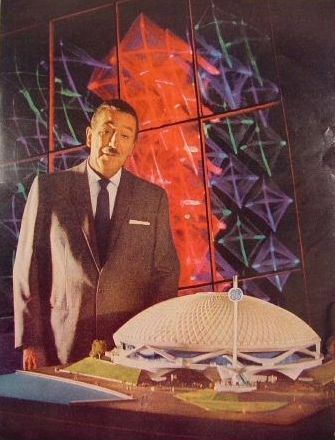 In summary, the Carousel of Progress’ charm and place in thematic history reaches far beyond the carousel theater show that we still have, today. In part, it is the base of the experience, and the most memorable. But the entire Progressland Pavilion was a thematic bastion of industrial artistry and extravagance. Corporate and commercial advertisement? Yes. But it left a lasting mark in the minds of those who saw it and were inspired by the spirit of progress and optimism the pavilion fostered. The art of corporate showmanship hasn’t changed much, since the days of international exhibitions and World’s Fairs.